The progressive Democrat plan envisages sweeping measures to combat climate change and a raft of social ills. It’s vague, flawed and hotly opposed by Republicans. But backer Alexandria Ocasio-Cortez has a knack for getting noticed – and a serious environmental debate is overdue. 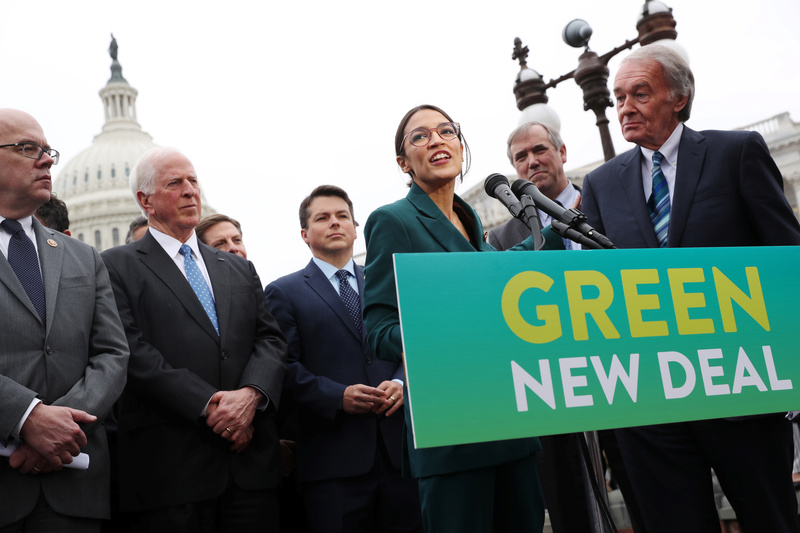 Alexandria Ocasio-Cortez, rising Democratic star and new member of the U.S. Congress, and Democrat Senator Ed Markey on Feb. 7 laid out the goals of a so-called Green New Deal to achieve net-zero greenhouse gas emissions in 10 years. The non-binding resolution is the first formal attempt by lawmakers to define legislation to create large-scale government-led investments in clean energy and infrastructure to transform the U.S. economy. It outlines several goals for the United States, including meeting 100 percent of power demand from zero-emission energy sources. The plan calls for projects to modernize transportation infrastructure, decarbonize the manufacturing and agricultural sectors, make buildings and homes more energy efficient and increase land preservation. The Green New Deal also aims to create an economic safety net for “frontline” communities that will be affected by the impacts of climate change and by a radical shift away from fossil-fuel use. In addition, it calls for universal healthcare and federal job and training guarantees. The platform outlines more aggressive climate and socioeconomic goals than sweeping climate-change legislation introduced by Markey a decade ago, which was approved by the House but not by the Senate.